What is a Championship Father? 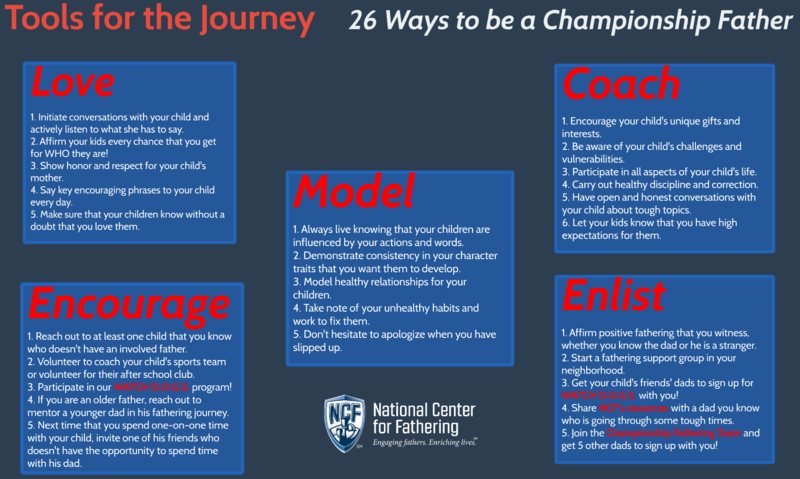 It is a dad who is dedicated to living out the five fundamentals that our research at NCF has identified in great dads: Loving, Coaching and Modeling their own children; Encouraging other kids; and Enlisting other dads. How exactly can you be a Championship Father? Well here are 26 ideas to get you started! Dad, make sure to join the Championship Fathering Team. It’s an effort to change the culture for today’s children and the children of coming generations! We want dads to sign up to create a national movement that can reverse the negative trends in our society. Sign Up Today!